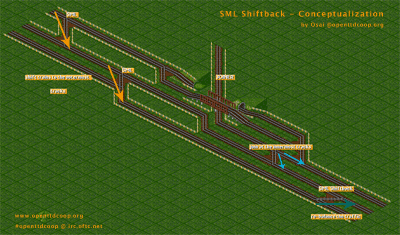 The shiftback construction re-arranges the train in a better manner using all the the tracks of the mainline. To avoid a complete shiftback-behaviour a looping train is used to block the outer tracks for a certain time. 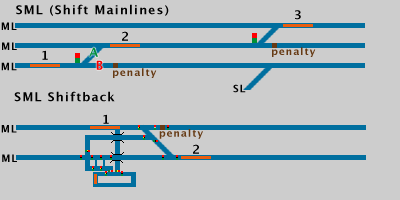 Otherwise shiftback wouldn’t be useful as all trains switch to the outermost lines and the innermost are not used anymore. In my opinion the shiftback option makes SML constructions more attractive to build. In the games we played so far, we decided to use SML only if we the entire network is one using the SML concept. Mainly because of the balancing issue. We also built station entrances optimised to cope with SML-like-traffic. Now it should be possible to build big Hubs with the advantages of SML. You can arrange the traffic/trains before entering the Hub and other trains, i.e. with the same priority can join easily on reserved free tracks which are only blocked if the others side traffic is too big or the whole scenario vice versa. Its probably the best to have three shifts: 2 to 3, 1 to 2 and 2 to 3 again. This is guaranteeing a shift from 1 to 3 too. In my opinion it is, because this is not a real SML construction. 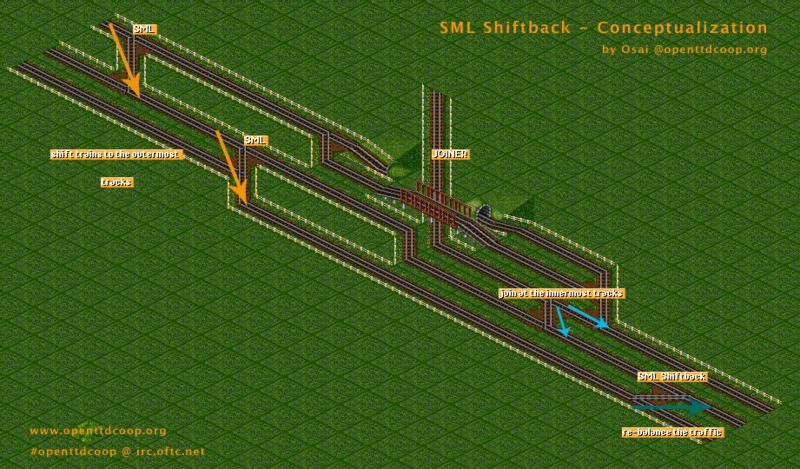 It just uses the cleverness of SML to provide free tracks for the joining trains, after the hub SML Backshift redistributes the trains again. This makes it possible to use the sml constructions in non-sml network layouts.